We LOVED that Pastor Charles gave the congregation a charge to adopt and went on for 5 minutes about the beauty of adoption, encouraging them to do so locally. We took Drew home to nap and gave him his first bath which was hilarious! After dropping Drew off, we went to Zen "Oriental" restaurant. Highly Recommend!! All the kids ran around by the water fountain, we sat under the thatched roof tents and had cocktails and great food. We are really roughing it here in Africa. I am so glad you are posting your journey! I love his attachment to the comb and his sophie. Campbell loved her sophie too. We can't wait to love on our new nephew when you return. Thank you so much for sharing your journey! The videos are wonderful! Great pictures! Drew is such a precious little guy - I can't wait to meet him in person. It's really fun to get to see the highlights of your trip as you're there. Tell Kristin she's doing a great job capturing it all. Looking forward to y'all coming home! Again...just loving all of the photographs. Drew looks like such a little love who has really warmed up fast! Do you not just adore Pastor Charles?! He is precious. Loved hearing about your Sunday morning at New Life Bible Church! Love that Andy shared. Cannot wait to hear more. Praying for every single detail. Sure love y'all. Now y'all can update Drew's slot on your blog with a photograph of him!!!!! He is SO darling! LOVE his smile! Glad yall are getting to have some fun. Thank you so much for sharing your journey. 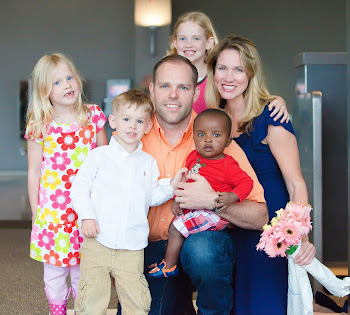 My son and daughter in law are waiting for their child from Rwanda and it gives us a lot of hope. Praying for your family and Drew. Drew is so cute! I hope you get your letter from the misitry soon so he can stay with you.